2013 13 BMW 118 D SPORT FINISHED IN METALLIC SILVER COMPLIMENTED WITH BMW SPORTS GRAPHITE GREY UPHOLSTERY.THE 118 DIESEL SPORT IS ONLY £30 PER YEAR ROAD TAX AND BMW CLAIM WE RETURN YOU OVER 60 MILES TO THE GALLON. STANDARD FEATURES ON THIS MODEL INCLUDE, REVERSE SENSORS, FRONT FOG LIGHTS, 5 DOUBLE SPOKE BLACK/SILVER ALLOY WHEELS, CRUISE CONTROL, LEATHER CLAD MULTI FUNCTION STEERING WHEEL,SPORT AND ECO PRO DRIVE,DAB RADIO, BLUE TOOTH HANDS FREE CONNECTIVITY, AND FULL ELECTRIC PACK. The 1 Series offers all that BMW stands for in a compact package. Available with three or five doors, this sleek and sporty car is a joy to drive, exceptionally comfortable to ride in as a passenger and economical to own thanks to the range of innovative engines on offer. 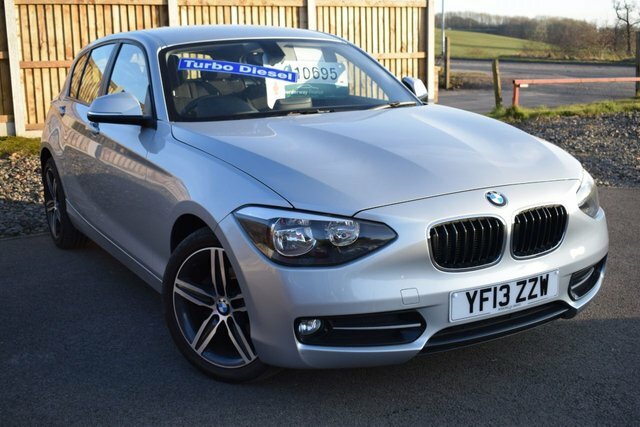 Here at Intercars Of Carlisle Ltd you'll find a great selection of quality used BMW 1 Series models, all of which have been thoroughly tested and checked before arriving on the forecourt. Take the chance to view our latest stock of used cars here on the website, before contacting a member of the team to discuss your requirements in more detail.